bliss has a number of wonderful holiday sets this year and they are so much fun. The one I want to discuss right now is called Mask For More. It is a five-piece set that includes four masks, a painting brush and a plastic washable palette to use for the masks. Each mask does a wonderful job of addressing one key skin issue. These are all peel-off masks, which are all the rage right now. Mix and match with these mini peel-off shimmer masks to brighten, detox, exfoliate and target T-Zone and pores. Each mask provides unique skin-pampering benefits, perfect for multi-masking. Use two at a time if you need to so. Full strength level of peel delivers powerful purifying and smoothing effects. These masks are great for spot treatments on dull areas that need extra attention. They are cruelty free and for all skin types. The Real Peel T-Zone & Pores: This powerful purple sparkle peel-off mask, with purifying charcoal powder, tackles oily T-Zones and visibly minimizes the appearance of pores. Skin looks smooth, balanced and shine-free. This full-strength level of peel delivers powerful purifying and smoothing effects. Great for spot treatments for clogged pores and areas needing extra oil control. It contains Charcoal Powder to help draw out impurities. Volcanic Ash is a potent purifier that can help address clogged pores. Kaolin Clay, which is used to make porcelain, is a mild clay that helps absorb impurities without removing natural oils. Cranberry Fruit Extract is an anti-oxidant that is known to act as a natural astringent to help cleanse away pore clogging impurities. This mask is vegan. The Real Peel Exfoliate: This skin refining gold sparkle peel-off mask lifts away dead skin cells to reveal a smoother, more radiant complexion. Lactobionic Acid and Glycolic Acid chemically exfoliate the skin. Squalane and Sodium Hyaluronate help balance and soften the skin. Infused with gold powders for a luxurious sparkle that makes the skin glow. Full-strength level of peel delivers powerful purifying and smoothing effects. Great for spot treatments on areas needing extra exfoliation. Lactobionic Acid is a next generation polyhydroxy acid derived from sugar and acts as a non-abrasive exfoliant to peel away and gently reveal new smooth skin. Glycolic acid is the smallest of most acids, this AHA penetrates surface skin cells, whisking them away to clear pores and retexturize skin. Squalane balances skin by improving water reserves and limiting moisture loss. Gold Powders make newly smoothed skin sparkle. This mask is vegan. The Real Peel Detox: This electric blue sparkle peel-off mask, has revitalizing asparagus stem extract and clarifying Moroccan lava clay, which helps extract toxins and remove excess oil for a smooth, fresh, healthy-looking complexion. Moroccan Lava and Bentonite Clay draw out impurities for a fresh appearance. Full-strength level of peel delivers powerful purifying and smoothing effects. Great for spot treatments on congested areas needing detoxification. Moroccan Lava Clay is formed from volcanic lava mined from eastern Morocco, it is rich in detoxifying minerals to help draw out impurities. Bentonite Clay is produced from volcanic ash, this highly absorbent clay binds to toxins and oils in the skin so they are more easily removed. White asparagus stem extract helps rejuvenate the skin by stimulating it’s detoxifying processes. Witch Hazel produces a visible pore tightening effect and removes excess oil from skin without over drying it. This mask is vegan. The Real Peel Brighten: This blush pink sparkle peel-off mask awakens tired skin and improves texture for a more even, brilliant complexion. It contains brightening Vitamin C and Pumpkin Enzymes for a smooth and bright appearance. Full-strength level of peel delivers powerful purifying and smoothing effects. Great for spot treatments on dull areas that need brightening and radiance. Vitamin C is a potent anti-oxidant and skin-soothing agent that helps protect skin from oxidative damage and it evens out skin tone. Pumpkin Enzyme gently exfoliates, softens and removes the buildup of impurities to effectively brighten dull skin and help visibly smooth fine lines. Trealose is a plant sugar known to help skin hold on to moisture more easily. This mask is not vegan. This kit will make the perfect holiday gift for any beauty junkie you know, skincare junkie especially (like myself), a Secret Santa exchange, or even for your mom, sister or best friend. The price point is perfectly reasonable and it really does offer a good selection of masks for all skin types. 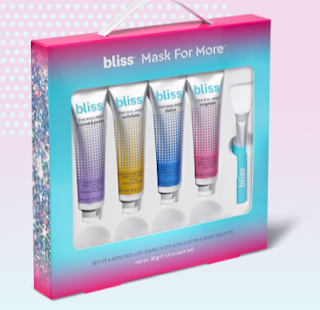 bliss mask for more retails for $20.00 and is available online at www.blissworld.com and www.target.com and Target stores. Like Bliss World on Facebook.com: https://www.facebook.com/BlissSpa; Follow Bliss World on Twitter: @blissspa;Follow Bliss World on Pinterest: https://www.pinterest.com/blissspa/ and Follow Bliss World on Instagram: https://www.instagram.com/bliss_spa/.